On this episode of Working: Syracuse, we speak to Annie Wilcox, who has worked as a caregiver at Francis House on Syracuse's Northside for eight years. Founded in 1991 by three sisters of St. Francis, Francis House was developed under the name "Project Home." From its inception, the goal was to create a setting where people with terminal illnesses could spend their final days in a loving and dignified manner. After seven years of operation at 108 Michaels Ave., Francis House renovated the facility to expand its capacity from six residents to eight in 1998. Six years later, a second, adjoined residence was opened at 114 Michaels Ave. Now, after more than 25 years in operation, Francis House has cared for more than 2,500 residents. Currently, Francis House accommodates 16 residents and often is at capacity. They are cared for by 29 professional staff, like Annie, and a group of around 450 volunteers that fills needs ranging from cooking to gardening to cleaning and beyond. That staff-to-resident ratio allows for personalized care that seeks to create a sense of home and family. However, the reality that patients are facing the end of their lives remains an ever-present subtext to the work of those at Francis House. But a focus on forging relationships and delivering attentive care means residents escape the confines of being just terminally ill patients. Instead, they and those who care for them spend their days as friends who just happen to be aware of the limited time they have to know each other. "What makes me want to come to work in the morning is knowing that when I get here, whatever small thing I can do on my shift will make a difference for their day," Annie Wilcox, caregiver at Francis House, says. 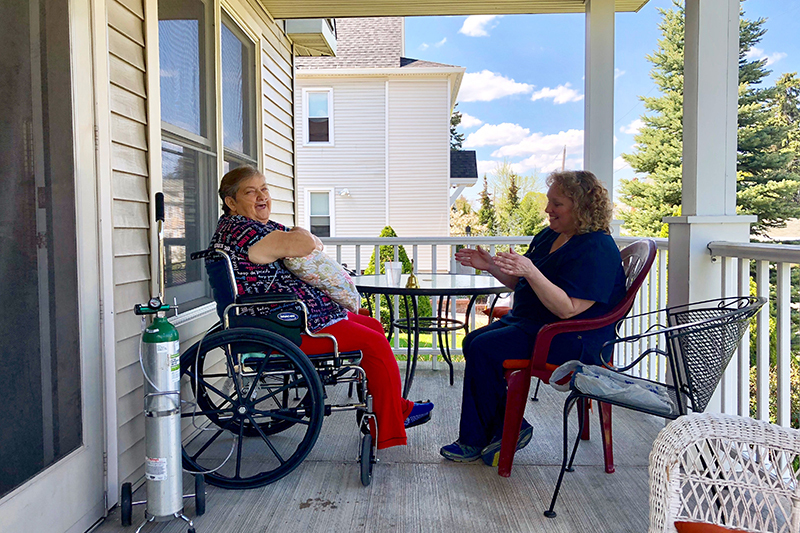 "You walk out and you look at them, and you see them sitting comfortable like that," says Wilcox, pictured here with resident Violet Leyland. "You turn back, look at that and you think — I've done my job." 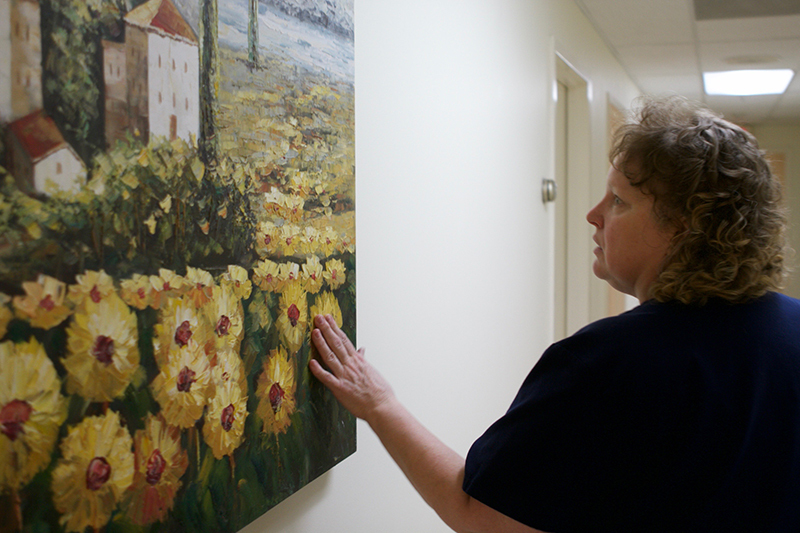 Wilcox and the other caregivers take pride in the facility's mission to create a homelike atmosphere. Annie checks in with a resident as she passes out the morning medications. Annie serves up a piece of pie made by one of 450 volunteers. BRONTE SCHMIDT, HOST: Hello and welcome to Working: Syracuse, the podcast inspired by journalist Studs Terkel featuring Salt City residents talking about what they do to earn a paycheck and how they find meaning in those jobs. I'm your host Bronte Schmit. This episode Nicole Engelman walks us through her conversation with Annie Wilcox who works as a caregiver at the Francis House on Syracuse's Northside. Annie is no stranger to loss in her personal or professional life. But despite it all she rarely stops smiling. ANNIE WILCOX: Hello sweet girl. Hi honey, it's me Annie. I'm gonna get you a drink, okay? We'll get your mouth wet. Let's have a little sip. Here we go. Got some applesauce. Good work! Alright sweet girl. Muah! I'm gonna go now. I'm going. 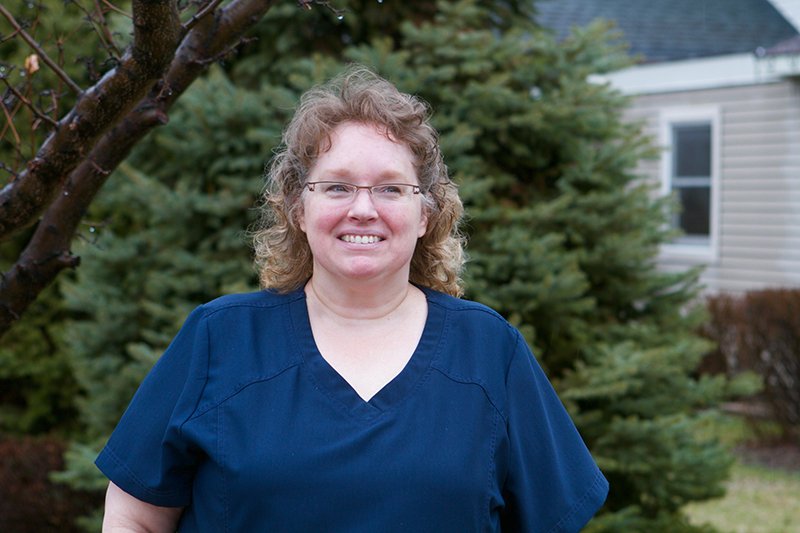 NICOLE ENGELMAN: Annie Wilcox has been working as a caregiver at Francis House in Syracuse, New York for eight years. Francis House provides a home and extended family to people with terminal illnesses, allowing them to live their last few months with integrity, companionship, and even laughs around the dinner table. ANNIE WILCOX: If I cannot answer it right away, when the resident needs something and they ring the bell, the beauty of that is is that I have these wonderful volunteers, so someone will touch that person and say, "I will let her know," so they feel that they've been heard and sometimes that's just enough to settle them down so they can wait that little bit of extra time for me to come... So it's really great to know when someone asks for help, it's just moments away here. NICOLE ENGELMAN: In order to make residents feel at home, Francis House looks exactly like one. Two large white houses are joined together by what Francis House employees call "The Link." Each house buzzes with life, from families playing cards in the living room, to the bright vases of flowers that seem to cover every surface. Residents decorate their rooms with family photos, and in the kitchen, it's common to find freshly baked goods and chatting, laughing employees. But all it takes is the sound of a distant bell ringing to disrupt this happy hum and send someone rushing into the hallway. ANNIE WILCOX: The typical day at Francis House begins with coming to report so the evening shift will pass off anything pertinent that they feel needs my attention immediately. Otherwise, we have a log that we write down the events of the shift for the next shift to read ... things that need like if there's a med that needs to happen right away or someone's daughter is coming and we need to get them cleaned up first so they look really nice, or that kind of thing, they give me that information. NICOLE ENGELMAN: At any given moment, Annie can be seen running from room to room, making sure every resident's needs are being met. Between rooms she briefly pauses in the hallway to say hello to a coworker, but then continues to the next room, greeting each resident as she goes. NICOLE ENGELMAN: Annie then passes out medication to each of her residents during breakfast and lunch, making sure every resident is comfortable and pain-free. ANNIE WILCOX: I will pass all the meds, and you know that takes me well over an hour because when you're in the room, they're gonna have other needs and you're not going to say, "I'll be back for that." You're going to help 'em with those things. NICOLE ENGELMAN: Sometimes Annie will even go beyond her regular duties to make sure her residents are comfortable as possible. ANNIE WILCOX: One of the things I enjoy is doing is laundry because it is something that I've learned about myself is that I do not like delayed gratification in any way, shape or form. I love for them to be able to wear their own belongings. I love going down there and putting fabric softener in them so they're all nice and soft and so they're not all static-y when they come out of the dryer. And then you go and you get 'em dressed and they put them on and then they're just like [inhales and sighs], "ohh" and they smell so good. That's the best feeling, isn't it? It's almost as good as smelling pie. NICOLE ENGELMAN: Besides her focus on personalized care, Annie believes one of the most important aspects of Francis House is that it exists to alleviate the burden that terminally ill family members can put on their loved ones, no matter how difficult that task may sometimes be. ANNIE WILCOX: What is the most challenging part of this job is balancing the need of the resident with the need of the family. Because you get them both. And ultimately we are here for the resident, but if their families aren't happy, the resident isn't happy. Especially if you'll find that you have a family with a large number of siblings, shockingly, not all of them agree on what's the best way to take care of their family members. So you'll have one part of the family saying, "I don't want to see my father in pain, give him everything he can have, keep him comfortable." The next family member comes in, and maybe she's been estranged with her father, and she wants to make peace with him before he goes. And if I medicate him to keep him comfortable, he may very well be asleep at the time that she's here. NICOLE ENGELMAN: Despite this difficult position that Annie can sometimes find herself in, she knows the person she is ultimately there for is the resident. ANNIE WILCOX: They're on a journey and we just get to help them cross the bridge basically. And so we're a bridge for many things. We're a bridge for their families so that they can stop taking care of each other and just be families again...it's like a little bridge to fix the gap that has separated them with the illness. NICOLE ENGELMAN: Annie understands the challenges that caring for a loved one can bring. She lost her own daughter, Holly, at just 20 years old. ANNIE WILCOX: I had a daughter with a terminal illness, and that's the reason why I do this. And um I walked that road with her already and she pretty much taught me everything I needed to know. So you wouldn't have even known she was dying except for her occasional cough. You just got to, she just enjoyed the little innuendos of each and every day. And I think that is the beauty of being with someone who knows they are dying. NICOLE ENGELMAN: But despite this experience with loss, Annie's work at Francis House sometimes takes an emotional toll on her. On any given day, Annie could come to work and find that one of her residents has passed. ANNIE WILCOX: Well, I'm not gonna lie... sometimes it's a shock when you come in and someone who you least expected has passed. It's sometimes you feel a loss but as a rule, we know that's what we do here and so... I struggle for the right words. It's not that you're numb to it, because you never could be. Um, but um, recently we just lost a resident in 108, and I did not realize how much she was paying attention to all the little details of what was going on in our day to day lives. Then one day I had mentioned to her that my youngest was pregnant, and she remembered that when I came back in two weeks. And you know she would just retain really neat things and I just found her such a delight. She had a very dry sense of humor, which is not generally my match for a friend. But I have to say that she just tugged on me in a really special way. And she only recently just passed and I do miss her. But it was great fun while it lasted. NICOLE ENGELMAN: But this resident also left an impression on Annie, for an entirely different reason. ANNIE WILCOX: I could see her getting closer to the end I felt myself desperately wanting to give her a word to give to Holly. And it troubled me that I thought of that. It just like popped into my head one day. And I thought oh my God this is not about me, this is about her. But I did go through that. I don't know if it's because I was so close with her and I knew how much my daughter would enjoy her, and you know it's just a very unusual line of work, to say the least. NICOLE ENGELMAN: After her years as a caregiver, Annie has come to look at death differently. She remembers her residents as friends, dancers, entrepreneurs, celebrating the lives they let her be a part of. Annie even recalls caring for a congressman's wife, and a homeless woman who at Francis House, finally had a family. ANNIE WILCOX: I mean, truly you or I could die before one of them from any number of things, car accident, illness, anything. Our days are already numbered. We don't know that they hold for us. So to walk with someone who knows her days are numbered and to see her appreciate the laughter or the beauty or the flavor of food or a scent of a candle or just simple things that maybe we forget and so I think that I've said this before, people who are dying don't want to sit around and wait to die. They want to live until they do. BRONTE SCHMIDT, HOST: Thanks Nicole. Because of Annie's dedication to Francis House she and her husband of 10 years have still not yet gone on a honeymoon. But they recently bought and RV and look forward to little getaways until retirement. BRONTE SCHMIDT, HOST: That's all for this episode of Working: Syracuse. Check out our website www.workingsyracuse.com for more interviews and extra content about Annie. Be sure to follow us on Facebook and Twitter @WorkingSyracuse. This episode was written by Nicole Engelman and Julianna Whiteway. The episode was produced by Jared Bomba. Extra help came from Katie Cohen. Our theme music is by Logan Piercy. I'm your host Bronte Schmit, and it's time for us to clock out.